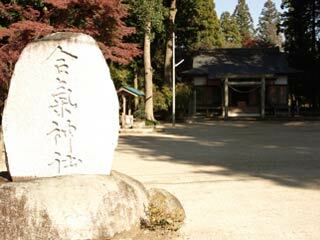 Aiki Shrine (合気神社) is the only shrine dedicated to Aikido in the world. It was built by the Founder of Aikido, Morihei Ueshiba in 1943. It is enshrined Sarutahikonomikami and 43 other gods. Many great Aikido legends stayed here and trained Aikido, and today, many Aikido-ka visit from all over the world to train. There is parking. Iwama Dojo is right next to Aiki Shrine. Aikido Founder Morihei Ueshiba was born on December 14th, 1883 in Nishi no Tani Village, Nishi Muro County (currently Kaminoyama Tanabe City), Wakayama Prefecture. In 1931, he founded the Kobukan Dojo with a space of eighty tatami mats (the current Aikikai Foundation Aikido Hombu Dojo) at 102 Wakamatsucho Ushigomeku Tokyo. In 1942, in pursuit of completing his long-cherished ideal philosophy of Bu-No- Ichinyo (the unity of martial arts and agriculture), he moved with his wife Hatsu to Iwama Machi, Ibaraki Prefecture. There he erected an Aiki Shrine in 1943. In 1945, he completed a Dojo (the current Ibaraki Branch Dojo) with about 100m2 of Land which became the birth place of Aikido. Aikido is modern martial art which was completed by the Founder by improving upon many of the skills of ancient Japanese martial techniques ; they were enhanced in their spirituality by character formation through hard training, with the added element of seeking the path. The Founder said, "True Budo is not to complete to determine who is stronger, but to align the energy of the universe, protect the peace of the world and currectly create and nurture all things in the universe." The Founder promulgated the establishment of human harmony through Aikido, to live in peace. The skills and sprit demonstrated by the Founder appealed to people from all walks of life, regardless of ethnicity, religion or nationality. It is currently practiced in over ninety-five countries. In 1960, he received the Medal with Purple Ribbon for Merit in the creation and dissemination of Aikido. In1964, he received the Order of the Rising Sun, Gold Rays with Rosette for Merit in the creation and dissemination of Aikido. On April 26, 1969, he passed away. He posthumously received the Order of the Sacred Treasure, Gold Rays with Neck Ribbon and the rank of Sho-Goi (Fifth rank in the Imperial Court). The Statue is to be produced and erected within the grounds of the Aiki Shrine, with the understanding and permission of Moriteru Ueshiba Doshu, as part of a fortieth-year memorial project of the passing of the Founder of Aikido. It praises and commemorates the achievements of the Founder with the supporting donation extended by many of the domestic and overseas practioners of Aikido.